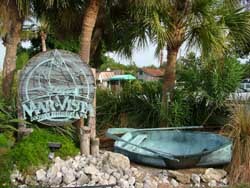 December 1 - 3 - We left Anna Maria Island on Friday at 12:20. Ed was a very gracious host and this morning he took me with him to a dive shop sale so I could pick up new fins and snorkels for both Deb and I. I also was able to get her a small weight belt and I got a thin skin dive suit to keep the coral and jelly fish away. We will have to get hers when she is along so it is sized right. It was a simple motor down to our anchorage into a headwind of 15+ knot winds and through two bridges that opened for us. The first one we were a few minutes early but they held it for another boat and opened 5 minutes past their intended opening time. The second one I had to run at 2900 rpm to make the 2 opening but they were nice and opened it at 2:02. This is a nice place for a stop. We dingyed in for happy hour on Friday and then we walked to the shops. There are a few of them but there isn't a chain grocery store here. We don't really need much but plan on dingying in for breakfast at another area Saturday. We heard about a great place for breakfast and plan on trying it out. This dockage is behind the "strip stores" and is a concrete wall with cleats on it. 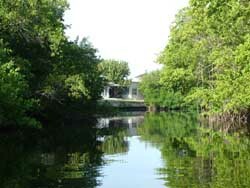 It is located at the very back of Bishop Bayou. As you can see from the pictures below, the entrance is small but if you go through it, you will see the concrete wall. The grocery store we went to is more of a gourmet store and prices are gourmet as well. 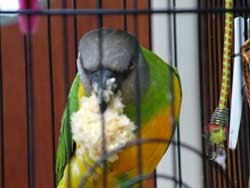 Jimmy Buffett was hungry too so you can see he is eating a partial ear of corn. Of course he doesn't worry about how he looks when he is eating. Once finished, he will clean himself up. As a matter of fact, right now he is taking another bath but you've seen pictures of that one before. Water is going everywhere in the boat so this is now a good re-cleaning opportunity for Deb. She already cleaned once this morning but now water is everywhere. 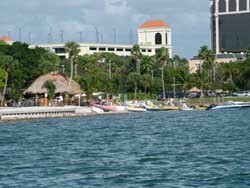 Yesterday, Saturday morning, after breakfast we made our way to Sarasota. This is an interesting town and the anchorage is in downtown. However, there are allot of people living on their boats and their boats are barely floating. I was warned about keeping an eye on things so we how have our dingy engine locked on along with a new cable to lock the dingy to the boat. I haven't seen anything and the people are nice but they may think they need things more than we do. After we anchored, we dingyed ashore to the dingy area to walk around. This is where you land and there are all kinds of dingy's here. The charge is 2 dollars a day or 25 bucks a month. We are waiting for Monday so we can pick up our mail so I took on the job of disassembling the diverter valve and macerator pump system. Ends up they are both bad which is why I can't pump out when off shore. Well there goes another 3/10 of a boat unit. (A boat unit equals a thousand by the way.) After troubleshooting, I then went to catch a bus to West Marine. Of course after I walked 1/2 mile to the station and sat down I figured out pretty fast with no busses around they didn't run on Sunday. A person walking through confirmed that for me. New plan, find a taxi. Well after waving at a couple and having them just wave back, friendly people down here, then another plan was in the works. I walked into the Hilton looked around then back out to the bell station and asked about getting a cab. Ended up they took me in their shuttle. I think they assumed I was a customer and I didn't tell them otherwise. They charged me 8 bucks so it didn't really matter. I bought everything I needed plus the coated steel cable, new lock and some stainless cleaner. Came back in a cab and it was 8 bucks too. Back on the boat I re-plumbed the entire system and it ran. I'm sure it will work when we use it next. 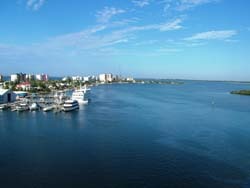 This afternoon we are off to explore Sarasota and get some good exercise. It is 80 down here today and beautiful tee shirt and shorts weather. December 4-5 - Yesterday we became experts at the local bus system. We first walked to the post office to pick up our mail and then we walked to the transfer station for the busses. This is where every bus in the city comes to transfer to other bus lines. It is a close walk from the area we anchored. We took the bus to the Wal-Mart and the Publix grocery store which was about 10 miles away. The bus is only 50 cents per person to ride so it didn't matter how far it was. We found the buses to be on-time and clean. We shopped first and since it took us more than an hour, we were waiting for the next bus. We decided to have lunch. This lunch wasn't one to write about but it fed us. We came back to the boat mid afternoon and spent the rest of the day enjoying the warm afternoon. Monday night things cooled off and the low was around 55 during the night. 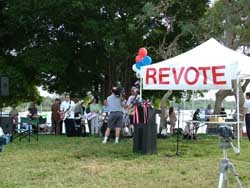 As we were walking around on Sunday, there was a rally at the park. Evidently Florida didn't like hanging chad and now they don't like computers. So, there were quite a few people who thought their vote didn't count. What a cool thing. People who want their vote to count. This is a great country. 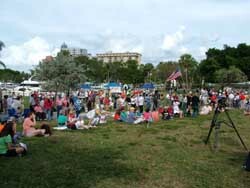 We were early in the rally and the people had already started to form. As you can see above, the TV crews were there too. Actually two stations were on the scene. We heard part of one song of the band but we had to leave because the sound was distorted. I know, leave it to a guy who has done sound in the past to critique the current system. It was distorted. There were lots of people showing up as we walked into town. I have no clue how this will end up but I do think it is great that we have a country that will allow peaceful protest to our own system. Isn't it great. If only every business would listen to their people when there is a disagreement instead of trying to squelch the discussion that doesn't agree with the "party line." I don't know who remembers the cows in downtown Chicago but we saw pelicans in Tarpon Springs and now clowns in Sarasota. They were all over the downtown area. 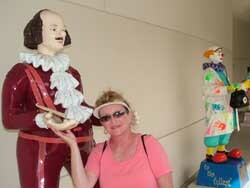 Of course the short one isn't a clown - that is Deb interacting with art. Or is it that life imitates art? Or art imitates life. I'm going to get into trouble soon so better move on. Today we went through 7 bridges. We wanted to go outside so we could skip some of this but the pass at Sarasota was closed by the Coast Guard because it was unsafe. Well, we had 6+ foot seas outside so it really didn't matter. We had NE winds so we were able to motor sail some. Most of the bridges were bascule type which lift, however, this one was a swing bridge. We found all of the bridge tenders were polite and helpful. What a great experience. 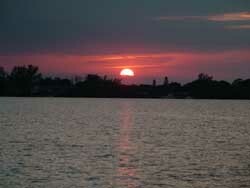 We anchored tonight in an anchorage we found on-line and it was just north of the bridge at Englewood, FL. Of course you can see where we are in our logs of where is Freedom. We chose this anchorage, which is exposed most of the time, because it is a good anchorage when winds are from the North East or the East. That is what they are to be tonight. 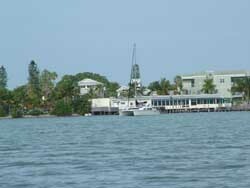 Tomorrow we will be off to Cabbage Key. By the way, I am happy again. There aren't derelict vessels and people who are trying to take things off of boats. We are back to having a good time rather than worrying about our boat. By the way, we have been getting emails from all over the country about our adventures. I would like to thank everyone who has emailed us. I am happy you are enjoying the site or blog as they say now. In addition, these emails keep me motivated to continue keeping it up-to-date. Thanks for the kind words. 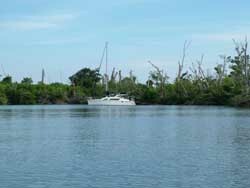 December 6-7 - We were heading for an anchorage at Punta Bianca Island and going down the intercoastal waterway. I had looked away for a minute and when I looked up, the channel was blocked. I thought where did that barge come from. Then I saw another one backing out and figured out this wasn't a barge, this is a car moving operation. Ends up they probably need a bridge here but bridges are expensive. 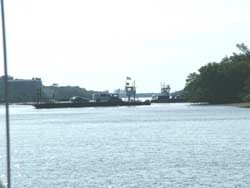 They use two small barges and work in syncopation to transfer cars to and from the island. We passed this and made it through another 3 bridges. The last one only opened every 30 minutes and wouldn't you know it, I was early. About 25 minutes. So I just threw out the anchor, turned off the engine and went below to do some clean-up on the old body. We pulled anchor 3 minutes before the bridge was to open and they opened on time. 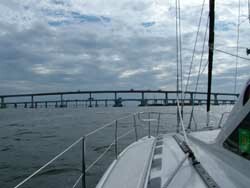 After crossing Charlotte Harbor we went to our anchorage. As I mentioned, we anchored at Punta Bianca Island which was billed as a great anchorage. You can see it in our locations log. It was a great anchorage. We were there with one other boat along with some visitors from the island. Yes, wild pigs. According to the guy on the other boat, these are Spanish descendants. Who knows? You can see the small piglet still feeding off of his mother. 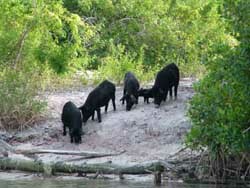 Evidently, there are another 8 or so piglets on the island. I guess the dog food the guy feeds them or mother nature takes care of them. This is our anchorage and we were anchored in the front but used about 85 feet of line to tie the stern to the bank so we wouldn't wonder around. We didn't have too much room to swing so that made more sense than getting out a 32 pound anchor and another bunch of pounds of 3/8 in chain. We then dingyed over to Cabbage Key for lunch. When we came back we were greeted by no-see-um's. Yes, little tiny flying, biting animals that were everywhere. They loved Deb, when they bit her she reacted the next day with small bumps. Evidently she is allergic to their sting. Great...... We are moving tomorrow. We decided to anchor out and just dingy in for lunch again and walk the island. After making a call to Cabbage Key we found they had dockage at 1.85 per foot which included showers and electric but no water. Who can blame them, they are an island and only get water from the rain which they store. After lunch we took a walk around the island. This picture doesn't do the left over devastation justice. 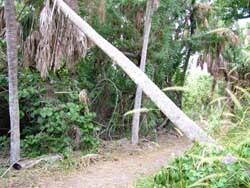 The hurricane in 2004 did over $750,000 worth of damage and took out allot of trees. You could see where they used chain saws to clear the walking paths. The buildings have all been rebuilt and actually look better than they did when we visited this area about 10 years ago when chartering a Gemini. 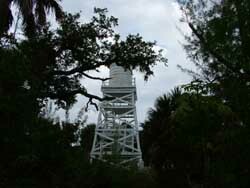 Below you can see the water tower which we climbed and took the picture from the right. 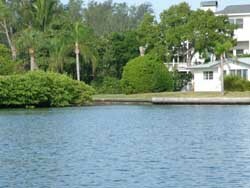 On the island, across the water, there is a VERY private development which of course we can't visit. Not in our price range. We are in a great area and the weather has been wonderful. It is supposed to turn "cold" tomorrow. 50 at night and 68 during the day. Well, I have to say that sure beats the weather everyone up north is getting. 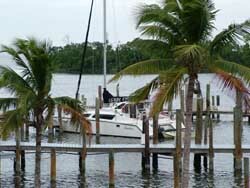 Tomorrow we are moving south again and will probably anchor out before picking up a mooring ball at Ft Myers. December 8 - Last night it was blowing. Yes, blowing. Winds were 20-25 knots and still were at the time we were leaving. Fortunately, two thing were going for us and one against. The wind was from the Northeast and that meant since we were going South Southeast the direction was good. The second thing is that it is so shallow in the bay going down to Sanibel, the waves just can't build so even though there were high winds, there weren't those close waves to deal with. The thing going against us was the wind was blowing on the starboard beam leaving the dock and at 10 am it was still blowing 17-20 knots. We put down the port board 3/4s of the way so we wouldn't blow around as much. ( We couldn't put it down all the way because it is fairly shallow in here.) Then we took off all of the lines except for those on the starboard side. Deb moved to the port side and held us off of a post and was ready to move to the next post in case we came to close. At this point, you have to let go of the lines, get the boat moving so you have control and trust the boat and yourself. Well, after all that, we did just fine and were off. 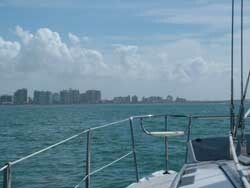 As soon as we left the channel for Cabbage Key we let out the genoa and off we went. I had the sail cover off to raise the main but when you are making 5.6-6.5 knots under the genoa alone, who cares. We are cruising. After about 2 1/2 hours wondering through the channel in the bay, we finally had to turn into the wind and motor over to the cannel to pass under the bridge going to the gulf. As you can see, they are in the process of replacing the bridge to Sanibel Island with a new one that won't have to be opened. I guess they were getting too many complaints because of those of us with sailboats. We called about 20 minutes out and let the bridge tender know we would be there for his 2 pm opening and he thanked us. About 10 minutes later I heard a sailboat call and wanted an opening. The operator told the lady it would be a 2 pm and she called back and said, can't you open it earlier. Now I had to laugh. The schedule is published and I was impressed with the bridge operator because he kept his cool even though he will be loosing his job in the next year or so when the new bridge is finished. We got there 5 min early and kicked back and enjoyed the sun on the water while simply enjoying the fact we would be back in the Gulf in minutes. As soon as we had passed the bridge we encountered this crane on a barge that was linking up with the smaller tug in front so they could go through the bridge to the other side. I guess it takes two of them to maneuver through the bridge. We went around the back side to make our way on to Ft Myers Beach. This point of entering the Gulf is interesting. You have some very shallow water that extends out so you need to ensure you know where you are. Of course that isn't too hard these days with a good GPS but I keep thinking about when we first started sailing without GPS and then I go back to much earlier explorers or should I say cruisers, who only had crude charts or made charts themselves. How fortunate we are today with the technology. In front of us lay Ft Myers Beach where we were to pick up a mooring and spend 5 days getting to know the area, meet up with a friend and reprovision. 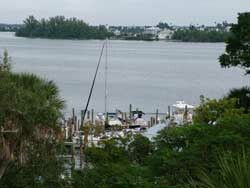 You will see more about Ft Myers over the next few days on the site, the moorings and the new mooring operator. As of this morning it looks like we may have great weather for the next week. As this front moves through we will get back up in the upper 70's in the day and low 60's at night. Also, it looks like the wind and seas will cooperate for our move to Marco Island on Wednesday and then crossing to Key West on Thursday leaving somewhere around noon or 2 pm and an arrival on Friday morning. We will figure that out later. We were given the name of a person in Naples we should call but it looks like we will be able to catch this weather window and plan on taking advantage of it. Down to where we are closer to good fishing and snorkeling. December 10 - Yesterday was our 55th day of living on our Gemini 105 otherwise known as s/v Freedom. And who would know they would plan celebrations for us. We started the day by taking our bikes to shore and then riding 2 1/2 miles to the grocery store. We shopped for the food necessary to reprovision. After checking out, we packed the cold food into our soft sided cooler and repacked the remaining food more efficiently and then put them into the baskets on the back of our bikes and biked back towards the boat. However, on the way back we were able to stop at a fruit and vegetable stand and pick up some more fresh vegetables. Later in the day we rode our bikes back to the beach, walked out on the fishing pier and then rode down to the park at the end of the island for a little beach walking. 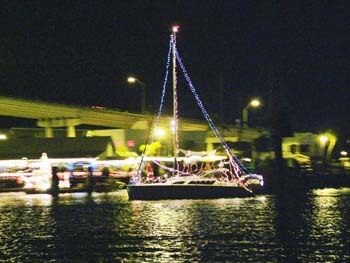 The first was the boat parade. Who would have known they would have planned this for our arrival. The parade started out up the bay and wondered through a few canals before getting to our boat at about 8 pm. What did we see? 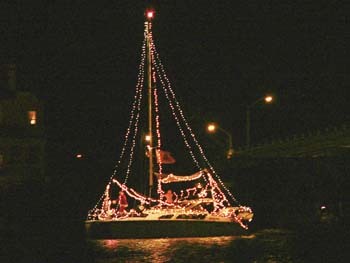 Lo and behold another Gemini 105 (above) all decorated and Santa on the front deck. Imagine that, Santa Claus even likes the Gemini 105. To the left is another picture of a boat that was in the parade. I ended up choosing the pictures based on which ones I was able to take that were clear. For the photo buffs, I had to change the automatic settings so I had a shutter speed of 1/20th of a second. Then I had to lighten them on the computer. You saw the Gemini before but I had to put it in again. 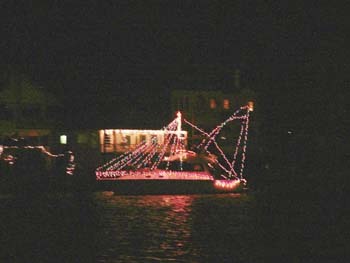 In this shot you can really see Santa on the deck and the elaborate display that even outlined the dingy davits on the back. The boat is fairly clear but parts on land aren't because I was trying to move the camera at the same speed as the boat when I took the picture. Enough of the photo talk..
We had a great time sitting on the aft deck watching the parade. It has been interesting this year because it is warm and we associate getting ready for Christmas with cold. Not a problem for all of you up north but it has been for us. Also, since we haven't put up a Christmas tree as we did at home, help Aunt Sandy, or see the preparations at church then it just hasn't been the same. I have to say, this helped. It didn't help with the fact that we won't be with family this Christmas however. When I mentioned celebrations for us earlier I used the plural on purpose. (Not one of my typical grammar mistakes.) You might have heard they delayed the Space Shuttle launch 2 days. It was also last night. My brother called me about 2 minutes before the lift off to tell me they were getting ready to launch. We were listening to CNN on the XM Radio but that wasn't the same as having the description my brother was able to give. He also related when he lived in Tampa they would go out and watch the takeoff's all the time. Of course it helps if there aren't clouds since the takeoff is about 300 miles away. 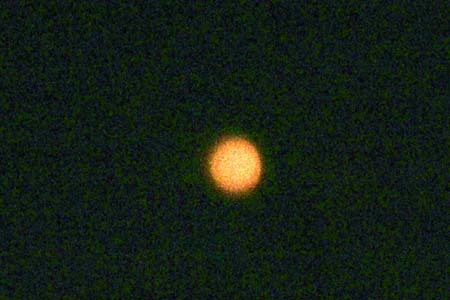 I was on the aft deck, camera in hand, and lucky enough to see the orange streak as it came above our horizon. Just as it did, I took the picture you see to the left. Then it disappeared behind a cloud layer. It was only visible for about 3 seconds. 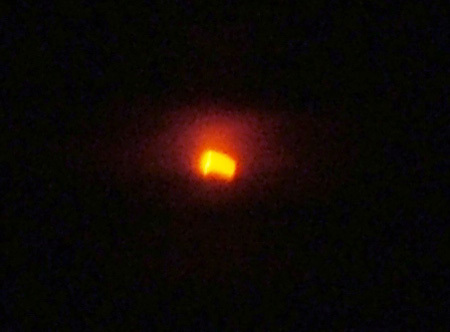 I then saw it above the cloud layer again for 2-3 seconds and it was gone. It was just too cool to see a Space Shuttle launch. That is still one of the items on my list to do for this cruise. If they will launch the Shuttle anytime within a month of when we plan on being on the east coast, we will stay for the liftoff. It was also fun to be on the phone with my brother at the same time of the liftoff. Experiencing something he had already experienced and listening to the fun he had and was having describing the events to me. Sunday we will be hauling water and cleaning up the outside of the boat. Then Monday a friend of ours, we were introduced to by our friends in Omaha, will be out to pick us up at 10:30 and we will spend the day ending with a dinner at her home that evening. That should be a great day too. December 12 - Yesterday we were picked up by Carol Kipplinger a person we met through our friends in Omaha. She was wonderful taking us to the Home Depot to pick up a new hinge for the toilet seat which I broke, another story, Wal-Mart for the obligatory visit, and a marina that had the Skipper Bob book on anchorages. This book we have been searching for since arriving in Florida. We found it all and then off to her house after taking her out to lunch at Rum Runners in Cape Coral. 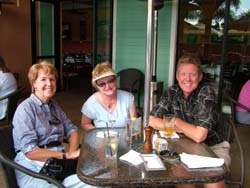 Of course we needed a picture of the three off us enjoying lunch and the waitress was too happy to oblige. After we arrived at her house, we helped with a few items she needed on her computer to figure out how to accomplish. Fortunately we were able to help with all but one. The color printer has dried up and must now be replaced. Sorry. Then we looked at all of the different kinds of vegetation in the yard and low and behold, in the next lot were a pair of burrowing Owls. 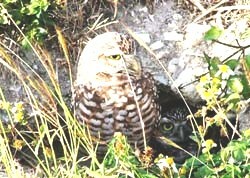 Yep, Owls that live and breed underground. Now this was different. The female was not a brave as the male and ran back into the burrow. Of course the male stood watch to ensure he would keep me away. I stood still for about a minute and finally the female stuck her head out of the burrow enough you can make it out in the lower right side of the picture. I lightened up the picture quite a bit to ensure you can see it on the website. Look at the dark area and you can see her eye and then her beak. Of course with all of the excitement we had to take a break before dinner for HAPPY HOUR and just a little wine and good conversation. We then were treated to a great shrimp casserole which I stole the recipe and will work at duplicating on the boat. In addition, the neighbors came over to join us too. We had some great conversations about their experiences and dreams. Everybody has to have a dream. 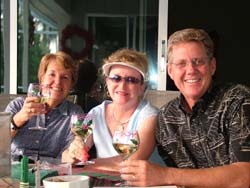 As if that wasn't enough, Carol is stopping by today to run us down to Publix to pick up our wine order so we are stocked up before hitting the Keys, then she is off to Naples. Since the operator of the mooring balls has changed, I figured I would document it here for others who are coming this way. To enter, you will pass Estero Island at the most northern point through a well marked and charted channel. 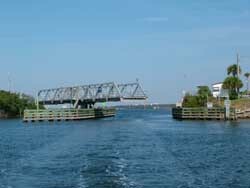 Once you turn south, you will see the bridge and after the bridge is the mooring field. I took both of the pictures from the top of the bridge. 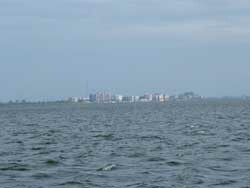 A number of years ago the city evidently decided they would install a number of mooring balls in Matanzas Pass east of Estero Island which is known as Fort Myers Beach. 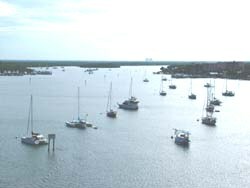 The mooring balls start as soon as you pass under the skyline bridge which is at the north end of Fort Myers Beach. As you can see to the right, they stretch along the pass for quite away before you are able to anchor on your own anchor. In our case, we picked up mooring ball number two which we reserved and you can see us in the picture on the lower left. 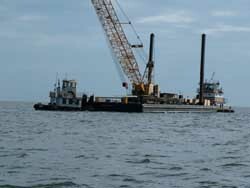 There is a new operator of the mooring field / balls at Fort Myers Beach. The new operator is Matanzas Inn. The managers name is Jerry who was helpful as I made my reservation. When we arrived, Jeff helped me and both gentleman were very helpful and trying to get off to a great start running the mooring field. 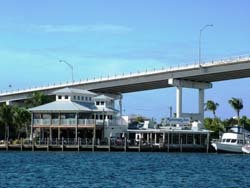 They are located on the right side just as you pass under the bridge and the picture of their establishment is to the right. The price for a mooring ball was $13 per day plus tax. They also had a discount for monthly stays which was $260 per month plus tax. 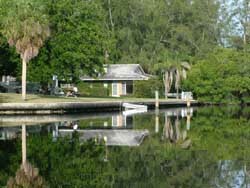 In addition to the mooring, you also have access to a shower by getting a key from the desk clerk, water at either the slip assigned as a dingy dock or the pool hose, laundry with two washers and dryers, a restroom in the laundry facility, trash is in dumpster's under the bridge, a place to lock bikes, and a dingy area. The official dingy dock is on the opposite side of the dock you see in the picture. The day before they left, they extended the docking area and it is much better. My bet is they will continue to improve it if their attitude so far is any indication. You can call for reservations at 239-463-9258 and you can also call on channel 16 for Matanzas Inn. We liked the convenience of the mooring ball and we were close to all of the action. In addition, it ends up Matanzas Inn has a great happy hour too. By the way, we found propane refills at the Red Coconut RV park which is a little over a mile away to the south. The Publix store is about 2 1/2 miles to the south and you can take the trolley starting at times square for 25 cents each person for a ride. In both cases, we rode our bikes which we enjoyed. Today I was able to finish a project which I worked on for almost eight years. Perseverance pays off if you are looking for the right answer. When I lived in St. Louis, I remembered an association for our street that became defunct. After tracking down the signatory on the account I became a cosignatory to protect him and the funds. After many years of discussions with other people on the street, we finally came to an agreement of what to do with the left over money in the account. Today, I am "finally" mailing the check to a different association who has agreed to spend the money on what is now my old block. What was difficult is that we are now cruising and the other signatory also moved out of town. Regardless, the project is almost finished and it is something I am proud of. We are transferring almost $9,000 out of limbo and I know it can make a difference on our old street. I wish you all well. Spend it appropriately. December 13 - We got underway this morning at 8:25 after picking up some diesel for the trip. Deb had a dolphin swimming with the boat looking up at her and she was so excited. He or she made several passes and each time looked up as she waved and clapped for him. As we made it offshore, we had very small seas and Deb loved that. We didn't catch any fish but so goes life. We anchored at about 2:45 and put in two anchors so we wouldn't be affected by the changing tides. We are supposed to be behind an island but guess what. The last hurricane took the island away. On our mapping program it still shows an island but later when I put in the coordinates into Yahoo, it shows shallow water where the island was previously. As we came into the site, before I had access to Yahoo's satellite photo's, I went below and hooked up the GPS to the computer to double checked our position. We were in the right place and then after talking to a fisherman we confirmed the island was here previously. I guess the bottom line is that the charts are more of a guideline than the actual topography. Tomorrow we plan on going fishing from the dingy and then we are off to Key West at about 5 pm. 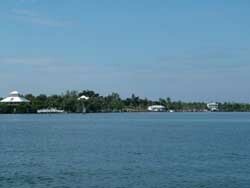 We want to arrive offshore in Key West when there is light and the plan is to arrive around 10am or so to make it to our new anchorage. So much for now. Weather is great with 80 degree high today and tonight should be in the lower 60's. I know, life is tough but somebody has to do it.